I taught a lesson in English on how to wear yukata for a couple of lovely ladies who visited Miyabi Yuki for our Yukata Souvenir Plan! Visitors from the USA! Don't they look great in the yukata they picked out? We just got a new shipment of yukata in, so we're ready for summer! At Miyabi Yuki, we have yukata sets with everything you need to wear yukata! 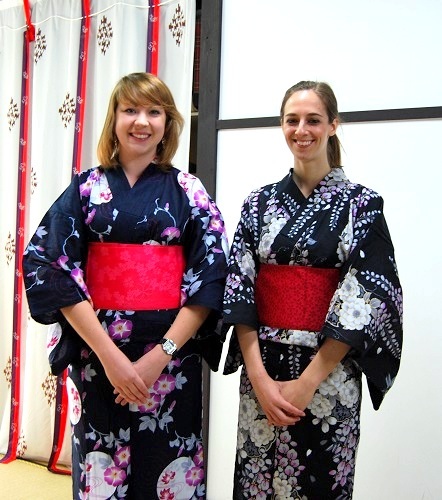 We will also teach you how to wear your yukata and care for it at no additional charge! The lesson takes anywhere from 30 to 60 minutes depending on the amount of people in the lesson and how much time you have available! Just give us a call or send an email to make an appointment! You can purchase a set whenever we're open, but if you would like to have a lesson please make an appointment! If you are visiting Kyoto, why not take the time to enjoy learning about kimono culture? You'll have a great souvenir and knowledge about how to wear it, too! See our English page for more info! © 2019 NPO法人 雅ゆき All Rights Reserved.